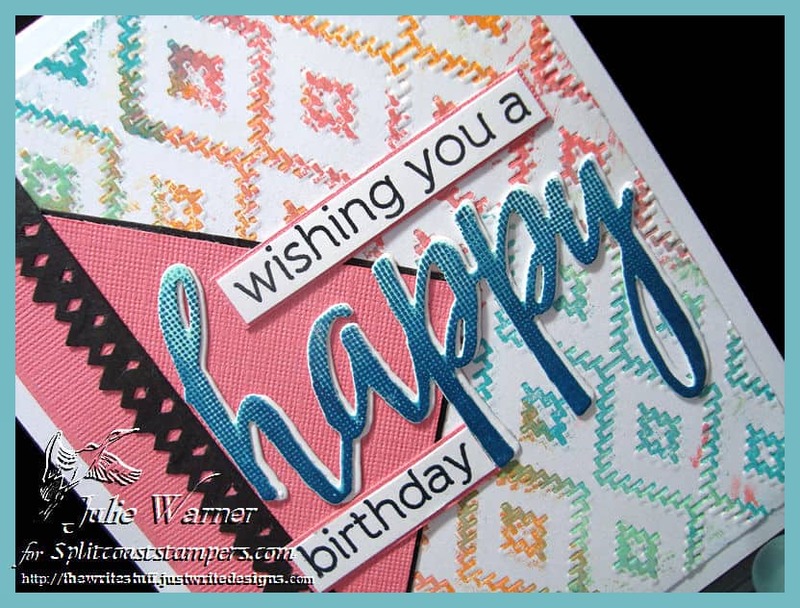 A big congrats to Donna, the newest Featured Stamper (FS498) on Splitcoast! 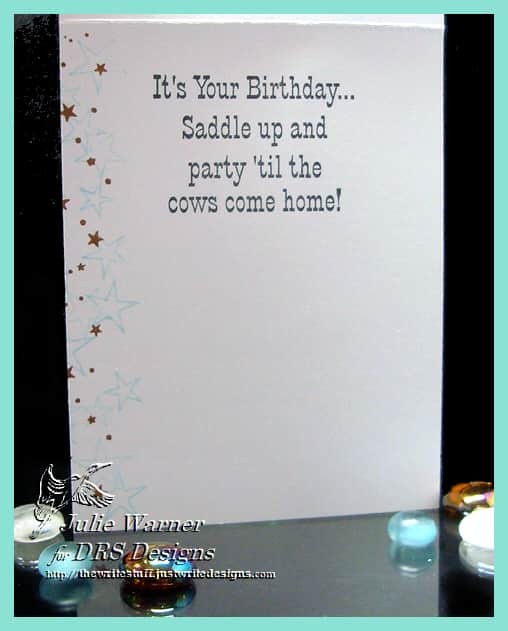 I didn’t have to go far to find THIS card to case (copy & share everything). 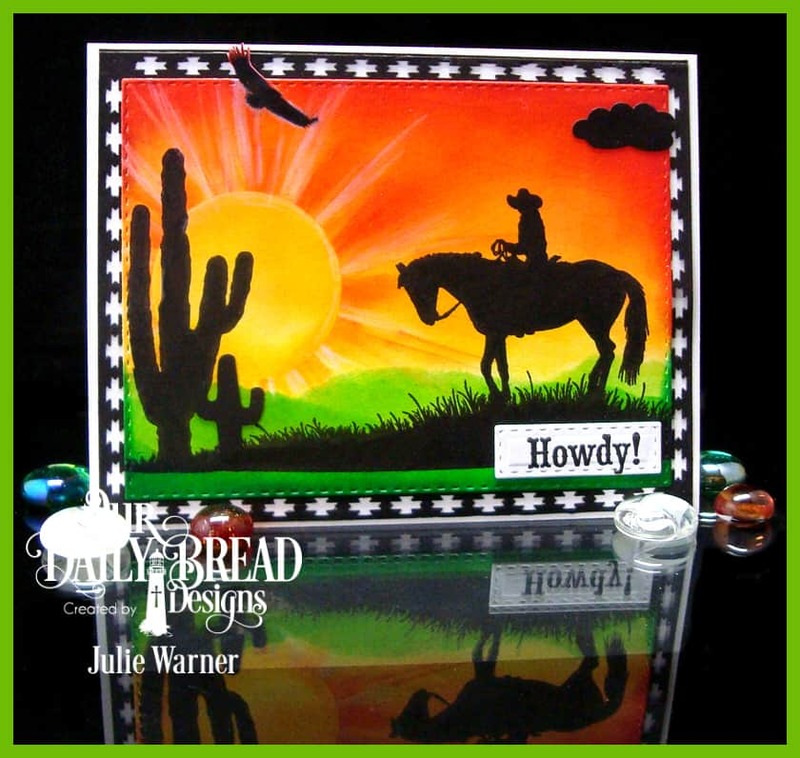 I kept the shaker card & most of the colors & layout, but I used different images, a star shaped shaker instead of a round one, & used a cowboy/southwest theme on mine. 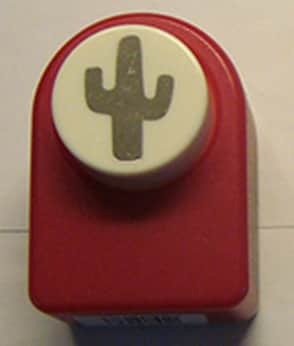 For my star shaker, I started by stamping the cowboy/cowgirl accessories image, coloring w/ Copics, then I did a little into the window to keep from cutting off the top of the boots when I die cut the stitched star opening. 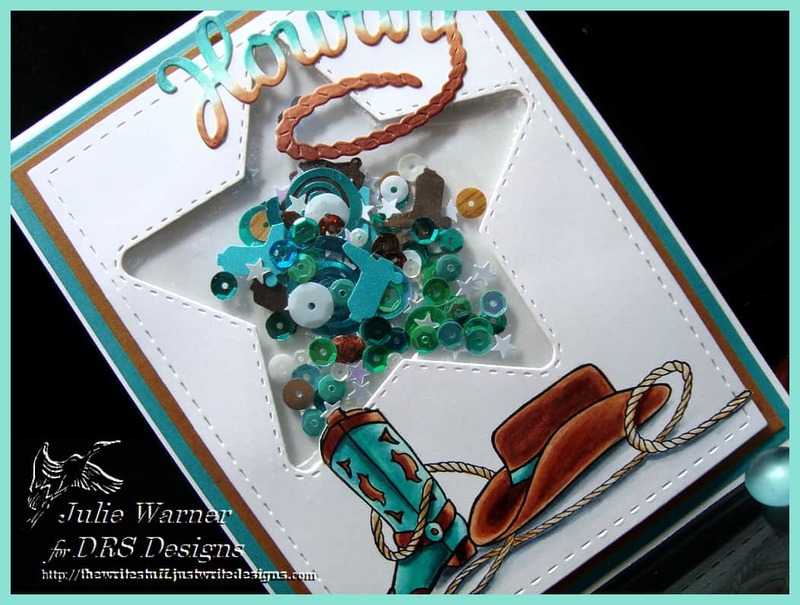 I made a larger star shaped pouch out of a page protector, sealed the edges but leaving one edge open, filled it w/ sequins, stars & little punched cowboy boots, then sealed the remaining edge. After attaching the shaker pouch behind the opening, I added foam tape all behind the panel & attached it to another white back panel. A couple of narrow frames (one brown, one turquoise) were added behind it before attaching to the card. 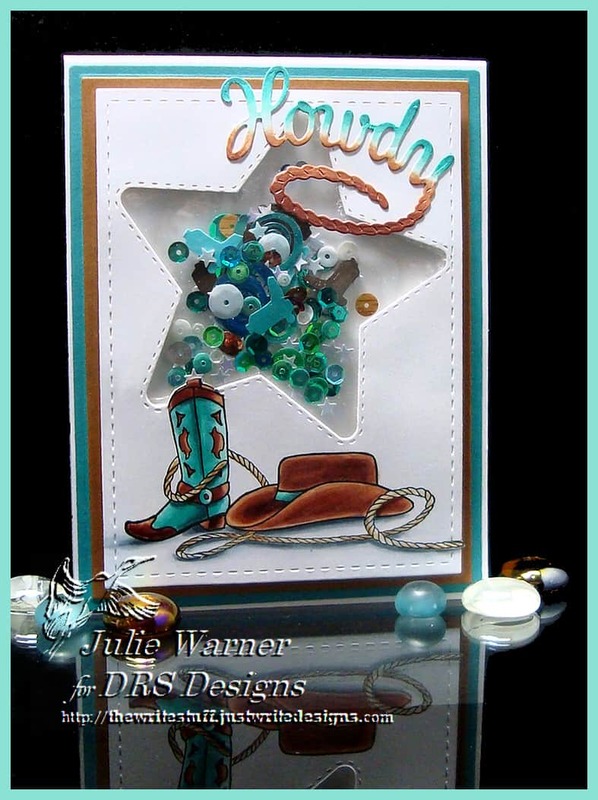 The Howdy was die cut & I used some of the same Copics to color it to match. 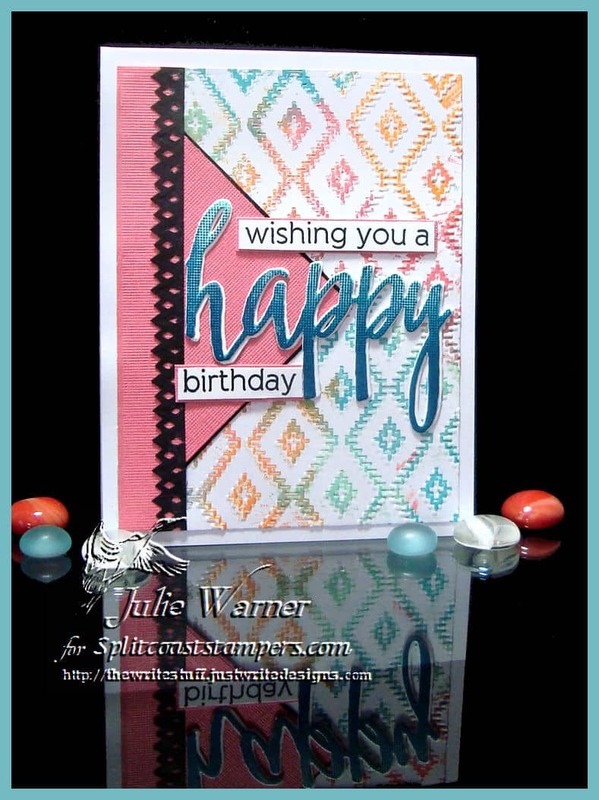 ODBD May Mid Month Release Blog Hop! 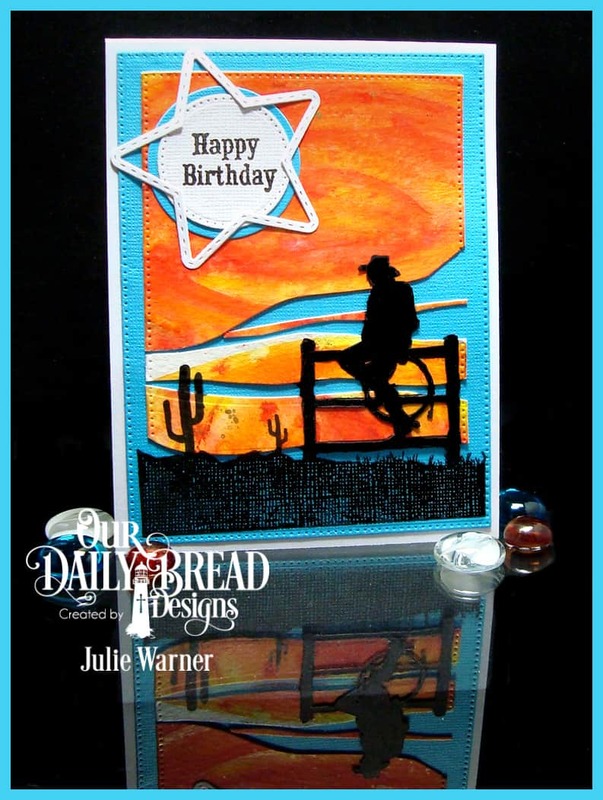 A big HOWDY to you & welcome to the Our Daily Bread designs May Mid Month Release! I tell you, this release is exactly what a Texas girl loves! And since that describes me to a T, I LOVE these! Not to mention how much you can do w/ a fabulous silhouette image. 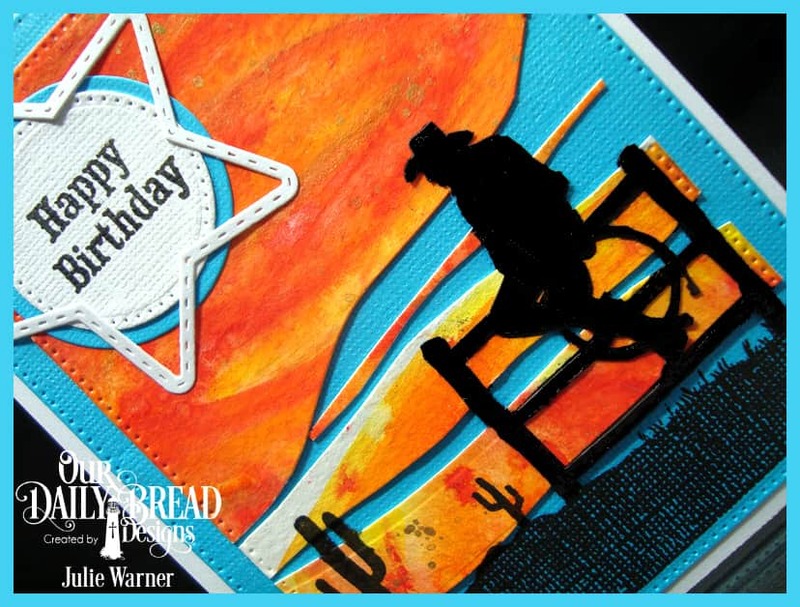 Prize Information: – Three randomly selected winners will each receive a $25 Gift Code to the ODBD Website just for commenting on the Design Team cards! 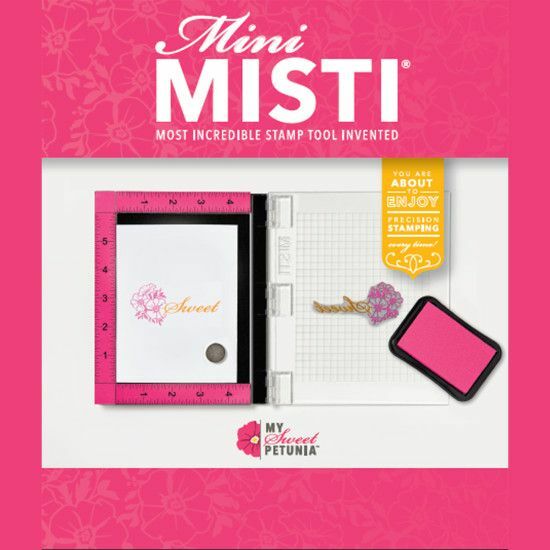 You have until May 18, 2016 at 9:00 p.m. EDT to leave your comments on the Designers Blogs for a chance to win! 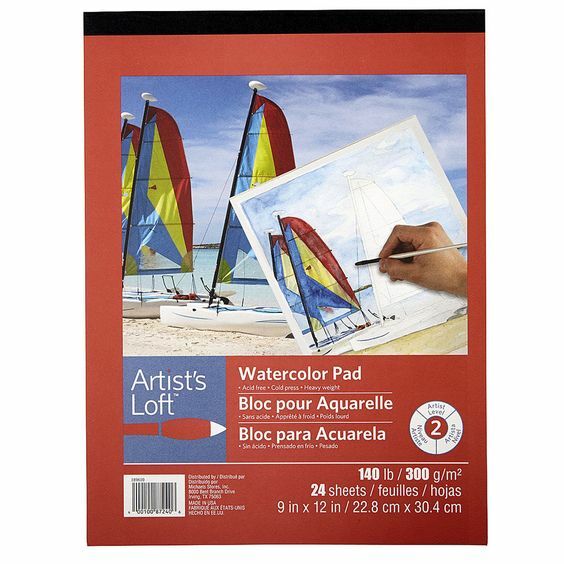 The Winners will be posted on the ODBD Blog on May 19th, so be sure to check back there to see if you won! To start my first card, I knew I wanted a brightly sponged background, so I dug out a few Kaleidacolor ink pads. They have the most vibrant colors and that’s what I wanted. I used a a torn mask for the ground & sponged on the greens, reversed the mask & sponged on some yellow for the sky. Then I added a big circle mask & sponged on more yellow, some orange & a little red. I used the edge of the sponge to add the streaks coming from the sun, then highlighted them a bit w/ a white Prismacolor pencil. 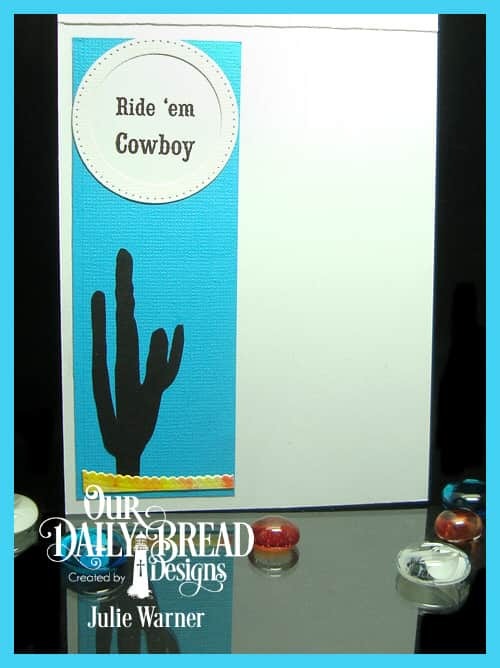 I put the bg into my Misti then stamped the silhouette cowboy, lg cactus & the eagle from the Bookmark Trees set. 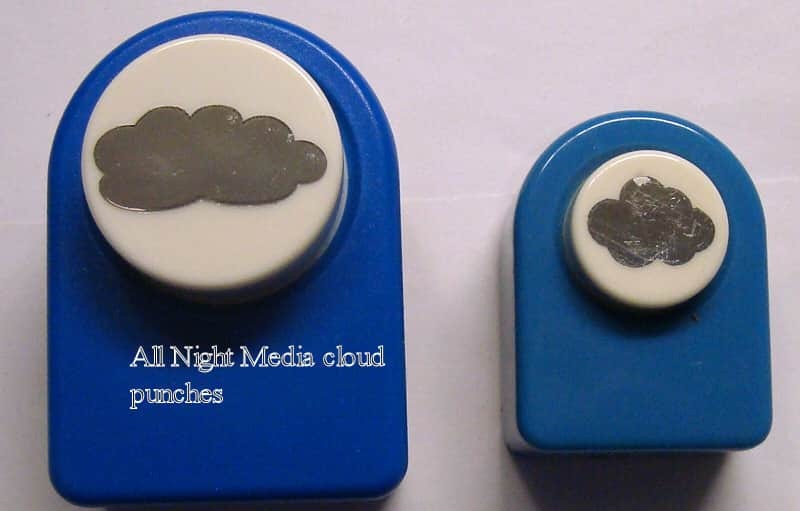 The small cactus & little cloud are punches. I die cut the scene w/ a Double Stitched Rectangle, doing a little out of the box for the eagle. 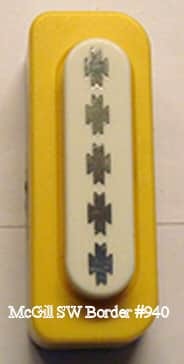 The black background was done w/ a small border punch. 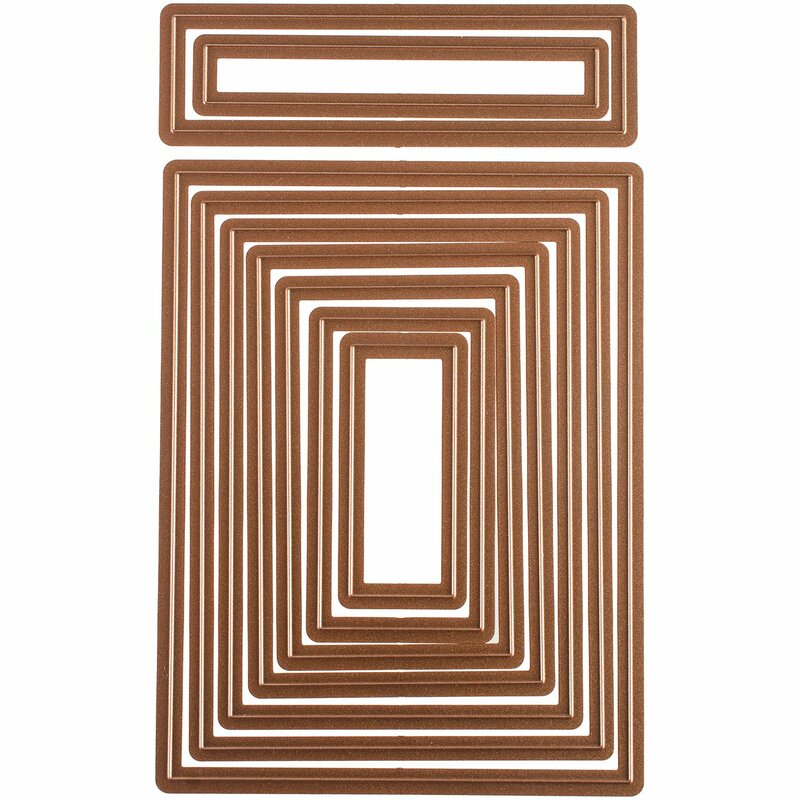 I made a corner template out of copy paper & used it to help punch all around the edges and have it be as symmetrical as possible. 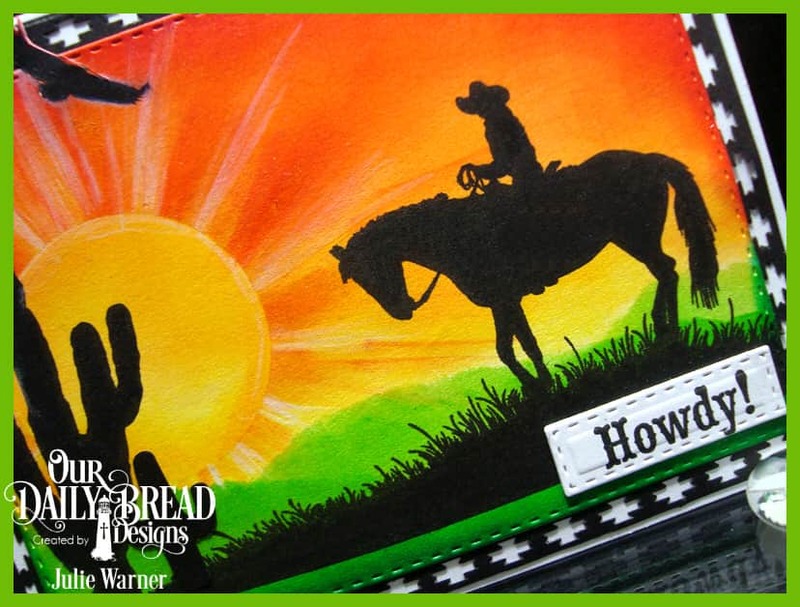 My second cowboy card started w/ pieces of a leftover watercolor bg. I liked the bright sunset colors w/ flecks of metallic gold & thought it might be fun to use them in a split background configuration. Having them separated like this was very challenging to say the least. 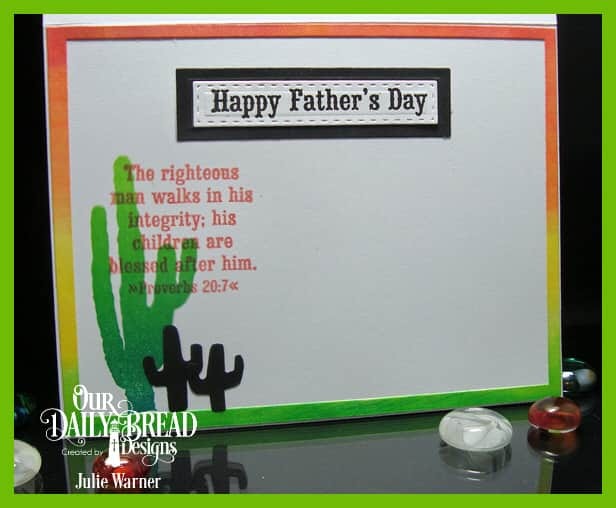 I placed them on top of the die cut turquoise bg w/ temporary adhesive & stamped the silhouette on top. Leaving the turquoise mat in place, I removed the orange w/c layer & stamped the silhouette again. I liked the look the textured turq c/s gave to the ground area, but not so much on the cowboy. So I stamped him again on a separate piece & fussy cut him. Yikes! 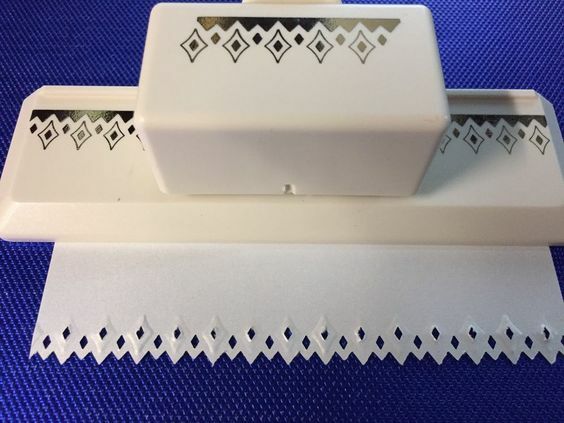 That was some fancy cutting, let me tell you! Then I had to go over all the cut edges w/ a black marker to keep them from showing. 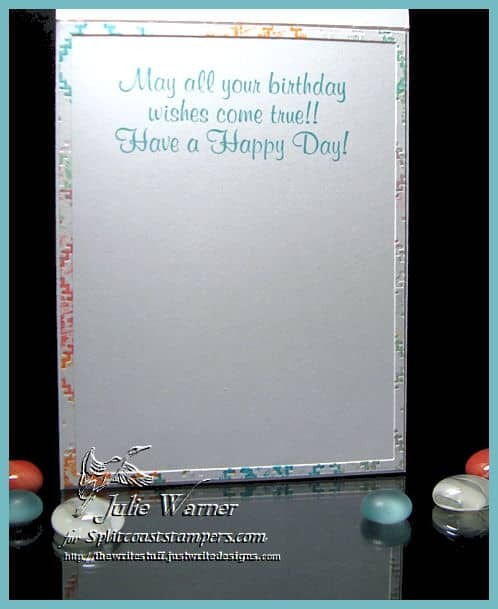 I added the greeting & big star frame to finish. Please be sure to visit & comment on all the DT Blogs! It will be so appreciated & also increase your chances of winning!